This is a list of current and former members of the Islamic State of Iraq and the Levant (ISIL), and its previous incarnations, including operating as a branch of al-Qaeda known as al-Qaeda in Iraq (AQI), from 2004–2006. Little is known about the leadership or members, as most use assumed names and many fight or appear in video with covered faces. Tarad Muhammad al-Jarba – "Abu Muhammad al-Shimali" (born 1979), key logistician of foreign fighters, Iraqi. Gulmurod Khalimov (born 1975), commander and recruiter, active in Syria (since 2015), Tajikistani. Ali Moussa Al-Shawakh – "Abu Luqman" (born 1973), governor of Raqqah, active in Syria (since 2011), Syrian. Fatiha Mejjati (born 1961), senior female commander, Syrian. Bajro Ikanović (born 1976), senior leader and trainer, active in Syria and Iraq (since 2013), Bosnian. Reda Seyam (born 1959), education official, active in Syria and Iraq (since 2013), German-Egyptian. Zulfi Hoxha – "Abu Hamza al-Amriki" (born 1992), senior commander and recruiter, active in Syria and Iraq (since 2015), Albanian-American. Umm Hamza, female sharia enforcer, Syrian. Umm Yasser Al Muhajir, female executioner, Syrian. Ahlam al-Nasr, propagandist (poet by profession), Syrian. Mubarak Mohammed al-Otaibi, Syria-based deputy leader of operations in Saudi Arabia. Ridvan Haqifi (1990–2017), commander and recruiter, active in Syria and Iraq, Kosovo Albanian. Killed on 8 February 2017. Sally-Anne Jones – "Umm Hussain al-Britani" (1968–2017), recruiter, British. Killed in June 2017. Akhmed Chatayev (1980–2017), trainer and organizer of activity against Russian diplomatic missions, Chechnyan. Killed on 22 November 2017 in Tbilisi by Georgian security. Denis Cuspert – "Abu Talha al-Almani" (1975–2018), German recruiter active since 2013. Killed in Gharanij, Syria on 17 January 2018. "The Beatles", hostage torturers and executioners, British. ^ "Al-Qa'ida in Iraq (AQI)". nctc.gov. National Counterterrorism Center. Archived from the original on October 12, 2014. Retrieved 22 November 2014. ^ Reuter, Christoph (18 December 2013). "Masked Army: Jihadist Group Expands Rapidly in Syria". Spiegel Online. Retrieved 17 November 2014. ^ "US State Department wants IS leader Abu Bakr al-Baghdadi, offering $10 million reward". NewsComAu. Retrieved 2 October 2014. ^ "Wanted". Rewards for Justice. Retrieved 2016-05-14. ^ "Islamic State identifies Abi al-Hassan al-Muhajer as new spokesman". 5 December 2016. ^ "In Turkey, a late crackdown on Islamist fighters". Washington Post. Retrieved 2 October 2014. ^ "The terrorists fighting us now? We just finished training them". Washington Post. Retrieved 2 October 2014. ^ https://www.counterextremism.com/extremists/abu-ahmad-al-alwani. Missing or empty |title= (help); "Most of Islamic State's leaders were officers in Saddam Hussein's Iraq". The Washington Post. 2015-04-04. Retrieved 2016-05-14. ^ a b Haytham Mustafa (31 December 2016). "Islamic State replaces Syrian officials by foreign jihadists in Raqqa". ARA News. Archived from the original on 1 January 2017. Retrieved 31 December 2016. ^ https://english.al-akhbar.com/node/22839. Missing or empty |title= (help); "MTV Lebanon - Interview with a Terrorist: Abu Ali al-Shishani". Retrieved 18 February 2015. ; "Sharkas Threatens to Retaliate Arrest of Family, Suspends Negotiations over Arsal Captives". Naharnet. Retrieved 18 February 2015. ^ Chulov, Martin. "One of the Islamic State's senior commanders reveals exclusive details of the terror group's origins inside an Iraqi prison – right under the noses of their American jailers". The Guardian. Retrieved 16 December 2014. ^ Treasury 29 September 2015. ^ "A New American Leader Rises in ISIS". The Atlantic. ^ Michael, Maggie (9 November 2014). "How a Libyan city joined the Islamic State group". Associated Press. Archived from the original on 28 January 2015. Retrieved 22 November 2014. ^ Warrick, joby (14 June 2014). "ISIS, with gains in Iraq, closes in on founder Zarqawi's violent vision". Washington Post. Retrieved 17 November 2014. ^ "ISIS Fast Facts". CNN. 16 November 2014. Retrieved 17 November 2014. ^ Manyuan, Dong. "The Rise of ISIS: Impacts and Future". China Institute of International Studies. Retrieved 22 November 2014. ^ "Iraqi forces kill al-Qaida 'war minister' in raid". Washington Post. 2011-02-25. Retrieved 2016-05-14. ^ a b Masi, Alessandria (10 November 2014). "If ISIS leader Abu Bakr al-Baghdadi is killed, who is caliph of the Islamic State group?". International Business Times. Retrieved 17 November 2014. ^ Mroue, Bassem (27 January 2014). "Key al-Qaida militant reportedly killed in Syria". Yahoo News. Associated Press. Retrieved 22 November 2014. ^ Taylor, Adam (3 July 2014). "Why being Chechen is a badge of honor for Islamist militants". The Washington Post. Retrieved 22 November 2014. ^ Salam Faraj (2015-05-15). "IS seizes government HQ in Iraq's Ramadi". Yahoo.com. Retrieved 2016-05-14. ^ Heras, Nicholas A. (31 March 2014). "Abu Ayman al-Iraqi Directs ISIS Operations in Eastern Syria". March 2014 Briefs. 5 (3). ^ Starr, Barbara (May 16, 2015). "Abu Sayyaf, key ISIS figure in Syria, killed in U.S. raid". CNN. Retrieved May 16, 2015. ^ "Islamic State 'deputy' killed near Mosul in air strike, US says". BBC News. August 21, 2015. Retrieved August 21, 2015. ^ "ISIS Confirms That US Killed Its Number Two Leader". Arutz Sheva. ^ "ISIS confirms killing of number two in U.S. air strike". Al Arabiya. Retrieved 2016-04-10. ^ Eugene Scott (14 November 2015). "U.S. airstrike in Libya kills ISIS leader". CNN. ^ "Taliban Captures ISIS Afghanistan Chief Mullah Abdul Rauf, 45 Others". International Business Times. 30 January 2015. Retrieved 6 February 2015. ^ "ISIS Targets Afghanistan Just as the U.S. Quits". The Daily Beast. Retrieved 3 October 2015. ^ Umberto Bacchi. "Isis: Islamic State kidnapper-in-chief Amr al-Absi 'killed in Aleppo'". International Business Times UK. ^ "Islamic State's governor for Aleppo reportedly killed in airstrike". Long War Journal. Retrieved 22 July 2016. ^ "Report: A former physics teacher is now leading ISIS". Business Insider. 23 April 2015. Retrieved 17 July 2015. ^ "A Top ISIS Leader Is Killed in an Airstrike, Pentagon Says". New York Times. Retrieved 25 March 2016. ^ "Who Is Shaker Wahib Al-Fahdawi, aka Abu Waheeb, aka Nusayri Hunter aka Teacher of the Nausayris?". Terrorism Research & Analysis Consortium. Retrieved 17 November 2014. ^ "IS Governor of Anbar killed in Airstrike". ^ "Islamic State leader in Iraq's Anbar killed, Pentagon says". BBC News. ^ "Thomas Joscelyn on Twitter". ^ Barbara Starr. "U.S. tries to confirm it killed top ISIS leader". CNN. ^ "Islamic State audio tape raises doubt whether Afghan leader dead". Retrieved 2015-07-13. ^ "Russian security service says killed North Caucasus Islamic State 'emir'". AFP. 4 December 2016. Retrieved 4 December 2016. ^ "Death of Abu Jandal al-Kuwaiti". CJTF–OIR. 29 December 2016. Retrieved 30 December 2016. ^ Laila Majdalawi (16 January 2017). "Three Malaysian ISIS jihadists killed in Raqqa airstrike". ARA News. ^ Amy Chew (15 January 2017). "Three Malaysian ISIS jihadists killed in Raqqa airstrike". Channel NewsAsia. ^ "Abu Usama al-Gharib - Counter Extremism Project". Retrieved 30 July 2016. ^ "Abdul Hadi Daghlas". History Commons. Retrieved 17 July 2015. ^ "Falluja raid 'hits wedding party'". BBC News. Retrieved 17 November 2014. ^ Roggio, Bill. "The Demise of Abu Azzam". Long War Journal. Retrieved 17 November 2014. ^ Fairweather, Jack; La Guardia, Anton (25 January 2005). "We have caught bomb mastermind, say Iraqis". The Daily Telegraph. Retrieved 17 November 2014. ^ Rabasa, Angel; Benard, Cheryl (1 November 2014). Eurojihad: Patterns of Islamist Radicalization and Terrorism in Europe. Cambridge: Cambridge University Press. p. 70. ISBN 978-1-107-07893-2. Retrieved 22 November 2014. 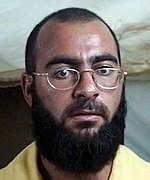 ^ "Zarqawi death a 'significant blow' to al-Qaida". The Guardian. 8 June 2006. Retrieved 22 November 2014. ^ Oppel, Richard A. "Iraqi Official Reports Capture of Top Insurgent Leader Linked to Shrine Bombing". The New York Times. Retrieved 22 November 2014. ^ Bill, Roggio. "Senior al Qaeda in Iraq leader killed in airstrike". Long War Journal. Retrieved 22 November 2014. ^ Bairin, Pierre; Tawfeeq, Mohammed. "Military: Mastermind of Samarra mosque bombing killed". CNN. Retrieved 22 November 2014. ^ Greenwell, Megan; DeYoung, Karen. "Al-Qaeda in Iraq Figure Is in U.S. Custody". The Washington Postdate=19 July 2007. Retrieved 22 November 2014. ^ "Al-Qaida in Iraq leader killed by U.S. soldiers in Baghdad". Star Tribune. Michael J. Klingensmith. 4 October 2008. Archived from the original on January 28, 2015. Retrieved 22 November 2014. ^ Roggio, Bill. "Al Qaeda in Iraq's second in command was a Swedish citizen". Long War Journal. Retrieved 22 November 2014. ^ Mohammed, Muhanad (8 May 2011). "Al Qaeda leader and 17 others killed in Iraq jail clash". Reuters. Retrieved 22 November 2014. ^ McCoy, Terrence (27 August 2014). "How Douglas McAuthur McCain became the first American to die fighting for the Islamic State". The Washington Post. Retrieved 22 November 2014. ^ Jim Sciutto (18 December 2014). "U.S. airstrikes kill 3 top ISIS leaders". CNN. Retrieved 18 February 2015. ^ Capelouto, Susanna (25 December 2014). "ISIS governor of Mosul killed in coalition airstrikes". CNN. Retrieved 26 December 2014. ^ "Senior Islamic State military commander, 'emir of suicide bombers' among Treasury's terrorism designations". The Long War Journal. Retrieved 18 February 2015. ^ "IS commander 'killed in Libya'". Times of Malta. Retrieved 17 July 2015. ^ "Egypt says militant leader killed in shootout: army statement". The Daily Star Newspaper – Lebanon. Retrieved 23 August 2015. ^ Brian Ross (12 November 2015). "'Jihadi John' Believed Killed in US Drone Strike, US Officials Say". ABC News. Retrieved 13 November 2015. ^ "Islamic State: Australian fighter Neil Prakash alive, arrested in Middle East, counter-terrorism officials confirm". ABC News. 25 November 2016. Retrieved 25 November 2016. ^ "Prominent Sudanese ISIS leader killed in Sirte, Sudanese sources disclosed – Libyan Express". 10 July 2016. ^ "Leading Sudanese Jihadist killed in Libya". Sudan Tribune. 2016-07-07. Retrieved 2016-09-19. ^ "US says it killed IS information minister al-Fayad". BBC News. 2016-09-16. Retrieved 2016-09-19. ^ "IS confirms death of propaganda chief Abu Mohammed al-Furqan". 11 October 2016. ^ "US Commandos Take Out ISIS Leader in Hunt for Top Terrorists as Obama Prepares to Leave Office". ABC News. Retrieved 10 January 2017. ^ "Key Islamic State 'finance emir' killed in eastern Syria, US says". Long War Journal. Retrieved 23 June 2017. ^ "Key British Isis member Sally Jones killed". The Guardian. Retrieved 12 October 2017. ^ Balkissoon, Denise (25 May 2018). "Canada's mysterious Islamic State returnee looks frighteningly familiar". The Globe and Mail. "Treasury Sanctions Major Islamic State of Iraq and the Levant Leaders, Financial Figures, Facilitators, and Supporters". 29 September 2015. Retrieved 17 July 2016. This page was last edited on 19 April 2019, at 05:38 (UTC).